The name Shea comes from s’i – the tree’s name in Mali. The Latin name comes from the explorer Mungo Park who introduced it to Europe. The shea-tree grows in the dry savannahs of Africa. It grows to a height of about 20 meter and starts bearing fruit after 8-12 years, though it reaches full producing capacity only after 40 years after which it can bear fruit for over 200 years. Flowering season is January/February and the fruit ripens between May and August. The fruits are the size of large plums. A “good” tree can yield up to 80 kg of nuts/year but normally a tree produces about 20 kg of fruit, giving 1.5 kg of butter. 100 kg of fruit will yield about 8 kg of butter. Process: The fruit falls as it ripens and is collected – traditionally by women and children. The outer shell is then crushed and removed, revealing another, inner, shell that is removed by boiling or roasting. Inside is the nut that is used. After drying, the nut is crushed to release the butter. This method of extraction leaves the butter intact but gives a lower yield and is therefore more expensive. Another process is by using a hexane solvent extraction which gives a higher yield. The butter is also made into an oil by reducing the amount of stearic acid. The cheaper, refined, variety is widely used by the chocolate industry and can also be found in margarine and other foods. 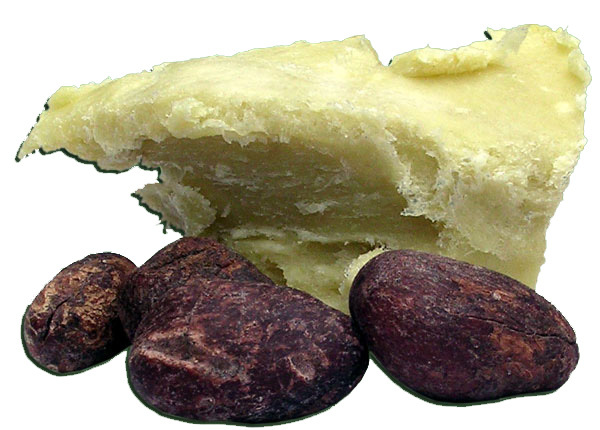 Shea-butter is extensively used by the cosmetic industry and can be found in many creams, lotions and emollients. The butter has been used for thousands of years by the Africans as food oil, lamp oil, protective salve and for soap. Therapeutically it has been used to treat sprains, muscular pain, and as an anti-inflammatory. It has also traditionally been used as a protective agent for skin and hair. Shea butter contains cinnamic acids which has sun-screening properties, protecting the skin against UV-rays. Anti-inflammatory properties help with cracks, skin-ulcers and fissures. prevention of stretch-marks by making the skin supple. Emollient on dry skin, hair and lips. Makes the skin soft and supple. For sprains, aches and rheumatism. Acne, itchiness, eczema, irritated skin, scars. Shea butter is white to creamy in color. It is readily absorbed by the skin without leaving a greasy residue, and the skin will feel softer after use. Being very mild, it is tolerated by most people. The butter is stable, giving it a shelf-life of about 2 years if stored cool and dark. It melts at a temperature of 35-40 degrees celsius. This entry was posted in Product information, Profiles, Skincare, Uncategorized and tagged hair, healing, lips, shea butter, skin. Bookmark the permalink.